The feng shui 8 directions are used to define 8 different parts of a space in terms of the buildings relationship to the sun. Each segment has qualities that relate to the time of day when the sun is in that direction. For example the east has the qualities of the rising sun and the morning. In addition the time of day also relates to the corresponding lunar phase and season. So we can say that the east part of a home has more of the characteristics of the morning, waxing moon and spring. The compass is used to define the feng shui 8 directions as north, north-east, east, south-east, south, south-west, west and north-west. The cardinal points are north, east, south and west. These related to the midnight / new moon / winter solstice – sunrise / waxing moon / spring equinox – midday sun / full moon / summer solstice – sunset / waning moon / autumn equinox. The remaining four directions are the changing points. For example the south-west is summer changing to autumn. The sun is the prime energy force we experience. The sun provides light, heat and a gravitational anchor that keeps us in orbit. We absorb photons from the sun into our skin. There is much research to show that the sun influences us with emotions changing according to our exposure to the sun. Depression and suicide increase during the winter in northern Europe. Historically communities living in temperate zones with distinct seasons have put more energy into commercial activity and industrialisation. Ultimately the earth’s relationship to the sun gives life to the plant foods we eat, creates our rhythm of night and day, as well as the seasons. Every day the sun repeats a cycle that nourishes our home with an energetic rhythm. This energy is called chi in feng shui. The sun rises in the east, moves up through the sky until it reaches its highest point in the south (north in the southern hemisphere) and then moves down through the sky until it sets in the west. There is a more subtle rhythm that occurs throughout the year as the sun rises further to the north-east and sets further to the north-west during the summer. In feng shui 8 directions thinking, the sun leaves an energetic or chi imprint on each part of our home as it moves from east to south (north in the southern hemisphere) to west. We can get clues as to the kind of imprints the sun leaves in different parts of our home by exploring the associated times of day and year. So for example we could associate our experience of the sun rising in the east with the feeling we have at the beginning of the day. In terms of a cycle the beginning of the day could be said to be at a similar point in that cycle to the spring in an annual cycle. This can described in terms of yin and yang, along with the five elements. 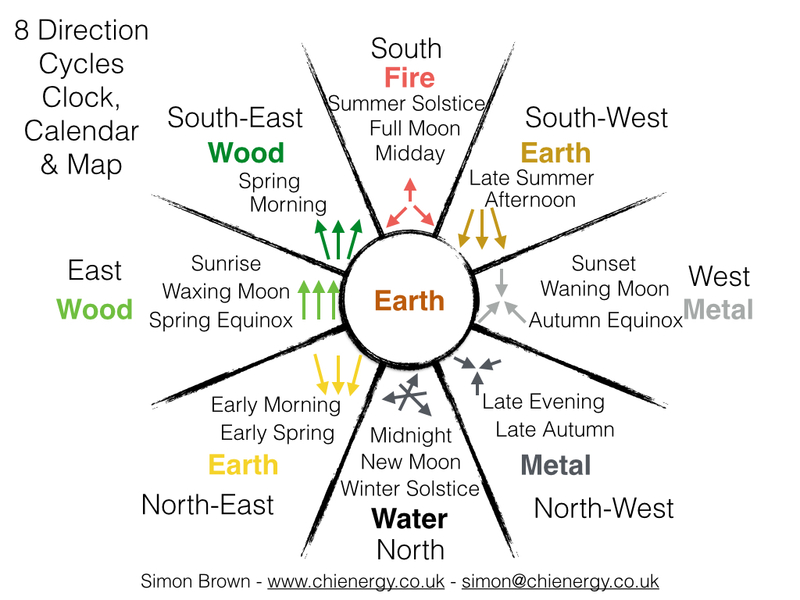 As we have already experienced many day and year cycles we already had the real life experience of knowing how we feel with phase of the cycle and this may give us interesting clues as to the feng shui quality of the energy / chi in different parts of our homes. With this information we can absorb more of those energetic / chi imprints by spending more time in that part of our home. So if I want more of the sunrise, spring qualities, I could spend more time in the east part of my home. Similarly sitting so I face east might help me absorb more sunrise / spring energy. It is also possible that sleeping with the top of my head pointing east will align me with more eastern energy whilst I sleep. Below is a quick guide to the potential qualities of each direction. The feng shui 8 directions in brackets are for the southern hemisphere. The top line of information informs us of the trigram where it is different from the element, the element, yin and yang quality, time of day and time of year, direction chi flows and an example how we could experience this energy. The qualities are based on my experience of the cycles and general patterns of human behaviour, however, you may respond differently and that may tell you more about how you interact with different parts of your home. I have added two very simple suggestion for activating the energy in that part of your home. You can use your observation of the sun, a map or a compass to see where the different feng shui 8 directions are in your home and then experiment, be aware and be sensitive to your feelings. If you want to activate one of the 8 direction energies try using the suggestion above for that direction and be sensitive to how you feel.